These special selections of Ozothamnus diosmofolius are a new wave of Australian Rice Flowers. Easy to grow and needing little supplementary water once established, these selections are colourful and compact garden plants and excel in floral arrangements. As cut flowers they are in high demand overseas for the florist trade. Easy to grow in most well draining soils, Coral Flush , Just Blush , Royal Flush , Springtime White and Winter White are versatile native plants that will bring welcome colour in bud and flower for a lengthy period in late winter. In sunny gardens they will grow into a shapely bush full of flower in the first season. Plants will grow to 2 metres and are well suited to edging and to shaping into low hedges. For floral arrangements stems should be picked when the buds fill out and just before the flowers opens. Do not put the stems in water. The flower heads will dry and hold their colour if placed in a cool dark place until dry. They can then be used in dry arrangements or as floral fillers in arrangements needing water. If the flower heads wilt, you have picked them a little early. 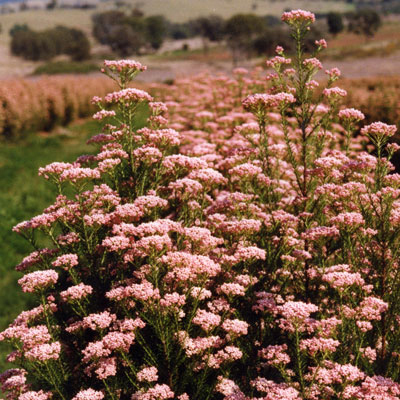 These Ozothamnus varieties will grow well in all states except Tasmania. They are best grown in light, well-drained soil. In heavier garden soils, plant on a mound. They are easy care and drought tolerant and attract few pests or diseases. Mulch to conserve moisture but keep mulch away from the stems. Prune plants heavily after flowering and lightly tip prune the shooting bush to encourage branching, which will produce more flower heads. Do not prune after Easter, as this would cut off the developing flower buds. After pruning, a native plant slow release fertiliser can be applied. Australian Rice Flowers are native to Eastern Australia from north Queensland as far south as the Geelong area in Victoria. Esther and Graeme Cook at Helidon in Queensland have been selecting and breeding from wild plants for many years and have produced a wide range of plants for the cut flower trade as well as these selected for garden performance.